The basic design for the current Spanish flag has evolved from the winner of a competition for a new war flag of Spain in 1785. King Charles III wanted to differentiate the Spanish war ensign (up to then plain white with the Spanish arms in the centre) from the Bourbon royal banners from the two other principal Bourbon kingdoms, France and the Two Sicilies. The flag that was chosen as war ensign is the direct ancestor of the current flag. 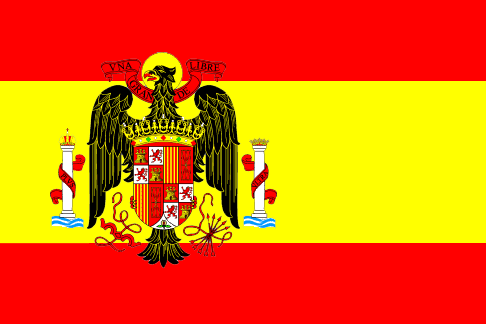 It was a triband red-yellow-red, of which the yellow band was twice the width of the red bands, a particular feature that distinguished the Spanish tribanded flag. The flag chosen as civil ensign, meanwhile, consisted of five stripes of yellow-red-yellow-red-yellow, in proportions 1:1:2:1:1. National flag (with the current arms) 1981. 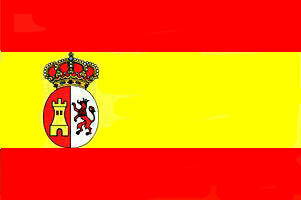 In 1981 the eagle disappeared from the Spanish national flag, leaving the current red/yellow/red with crowned arms. The crowned pillars flank the shield.